Think Modern Stools Aren’t Comfy? Think Again! 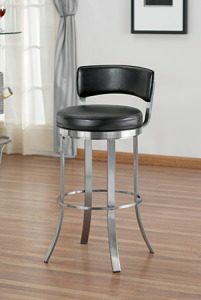 Did you know that modern bar stools are just as comfortable as any other stool? Although some design-forward modern bar stools look like they belong in a museum, these stools are just as comfy to sit in as any other stool. Read on to find out how a stool can be both modern and easy to sit in. The designer’s first priority is to make a stool that people want to sit in. The shape of the stool is crafted to achieve comfort, not the other way around. We don’t carry any stools that are artworks first and seats second. Modern stools have modern cushions. Compared to the stools you might find at an antique store, modern stools have more up-to-date cushions and fabrics. This means that the seat will remain strong and supple for years into the future. 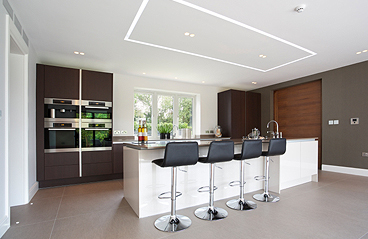 We’ve gone one step further to make sure all of our fabrics are treated with ScotchGard™. This will help keep them stain-free — because contorting yourself to avoid sitting on a stain is NOT comfy! You can choose your fabrics for most of our modern stools, too. Many modern stools have wide, welcoming seats. We only carry stools with seats wide enough to feel comfortable. We’d never ask you to sit on a fancy stool with a top like a bicycle seat. This beautiful Nicholas stool from Trica (left) and the Americana from Callee (right) are both modern stools – and look how comfy those seats are! They make me want to pull them out of my screen and switch chairs. Modern stools can help you sit ergonomically. 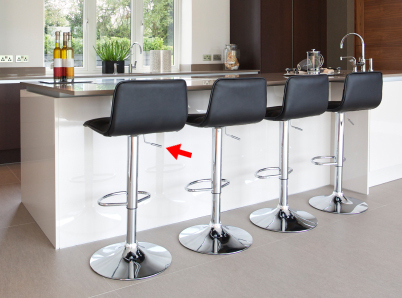 You can adjust the height of many modern stools, including these, to sit at the perfect height for whatever you’re doing. It’s no wonder these stools are a favorite for architects, designers, and craftspeople. Use the lever (as pointed out) to adjust your stool height. The pneumatic lift makes changing heights easy with the touch of a lever (no more spinning the seat over and over like the old days!). Whether you’re working on your laptop on the kitchen island, quilting in your sewing room, or drafting a design in your studio, you can raise yourself up so that your arms are at the right angle that we’ve all seen in those ergonomics guides. How else can modern stools keep you comfy? Many modern stools have backs and arms to so you can kick back and relax. And because modern stools are often metal, they have strong foot rests that can support the entire weight of a person. Wood stools’ footrests, on the other hand, aren’t recommended for putting all of your weight on. 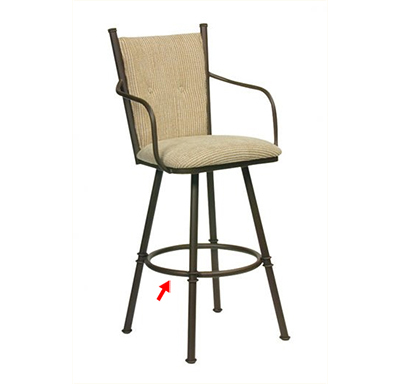 Bar stools with strong footrests. A strong, dependable foot rest improves the overall comfort of the stool because it makes it more comfortable to get in and out of, and gives you a wider range of seating positions (forward, with extra weight on the feet, for example). Have any questions about modern stools? Ask away! Call, email, or write on our Facebook page with your questions about modern stools. We’re happy to look at pictures of your home and suggest the best stool that will work for you – modern or otherwise!